Ten years ago, Alice Wood was living a normal life, balancing her career, family, and finances with con dence. Having grown up with a father who was a bank president from the pre-branch banking era and a mother who was influenced by the Great Depression, Alice learned prudence and financial responsibility at home. She knew instinctively how to handle money, until a brain injury sustained on a commercial airplane changed her life. After the injury, Alice encountered many new challenges; for the first time in her life she was overweight and in serious debt. Weight Watchers® allowed Alice to lose the weight and keep it off. Inspired by Weight Watchers'® daily discipline of journaling and the principle of group accountability, she decided to create a new and radically simple program to reclaim her financial stability. She called it Wealth Watchers. This simple program enabled her to meet her own financial goals and soon was helping thousands of others to do the same. Today, the Wealth Watchers program is an important part of the rapidly growing movement for financial literacy and empowerment sponsored by school, state, and federal government programs; corporations such as McDonald's and Visa; and several large financial institutions. Wealth Watchers is the story of Alice's journey from a life of having it all to a life of dealing with frustrating financial setbacks. In this book -- which presents the program and the principles in full for the first time -- you will find all the tools you need to organize your finances, complete your monthly budget, determine your disposable income, and understand which spending patterns are knocking you off-track. At the heart of the program is one simple calculation: your Daily Disposable Income (DDI), the money you can spend each day without going into debt. Amazingly, most people don't know their DDI. In this book Alice explains how it can help you make purchasing decisions, big and small, one day at a time, and build positive habits to last a lifetime. Using the Power of 365, you will learn how to analyze your expenses, stay out of debt, start saving again, and -- regardless of your age or income level -- thrive! Alice M. Wood grew up in Naperville, Illinois, where she worked as a successful attorney, representing at least 1,000 families in setting up their estate plans. Nine years ago she suffered a brain injury that, among other things, made it difficult for her to make good decisions. 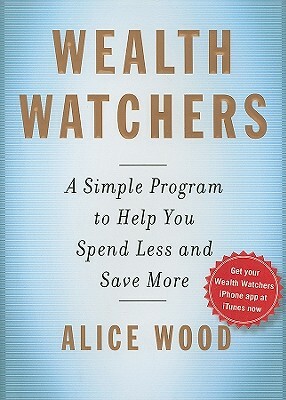 In her attempt to manage her weight and her money, she invented Wealth Watchers.